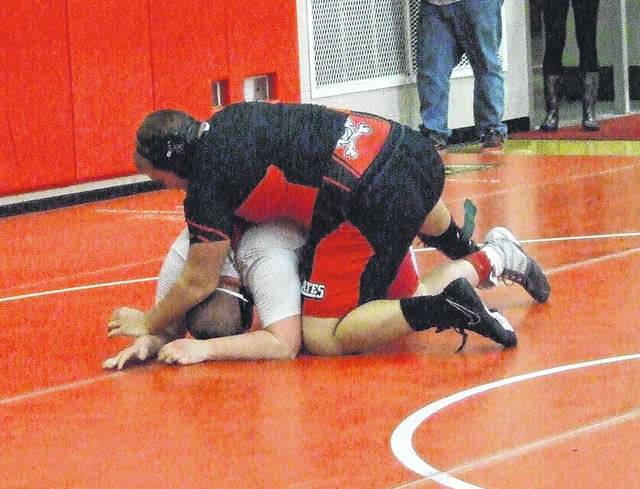 Tyson Moore of Northmor looks to turn Mount Gilead’s Kaleb Miller in a 285-pound bout on Saturday. Mount Gilead’s Andy Williamson shoots in on Highland’s Austin Kelley in the KMAC wrestling championships, hosted by Centerburg Saturday. Highland’s Christian Miller works to record a pin over his East Knox opponent in the 138-pound weight class of the KMAC tournament Saturday. Cardington’s Deven Speck has control of one of his opponents in the 285-pound weight class on Saturday. Northmor claimed the championship Saturday at the KMAC wrestling meet, finishing with four individual champions and 250 team points. In the meet, which consisted of the eight KMAC schools, as well as Elgin, Mount Gilead placed second with 213.5, Highland got third with 132 points and Cardington finished with eight point for eighth place. The event was ran with round-robin pools. Most weight classes only had one pool, while the 145-pound class had two four-person pools and finished with a double elimination tournament. Schools were allowed to wrestle multiple competitors in weight classes in order to fill out the pools. Gavin Ramos finished 5-0 at 126 points to win an individual championship for Northmor. Tony Martinez (145) and Conan Becker (152) also had 5-0 days culminating in titles, while Conor Becker was 4-0 for first place at 160 pounds. Finishing second for the Knights were Dale Brocwell (106), Manny Heilman (113), Austin Amens (120), Wyatt Lessick (170) and Tyson Moore (285). Third place finishes went to Aaron Kitts (132) and Austin Wheeler (182). Also, Eli Davis was fourth at 138, Kyle Price took fourth at 152 and Mike Delaney placed fifth at 126. Mount Gilead also claimed first place in four weight classes. Joshua Sullivan won his only match at 113 for the title, while Nate Weaver was 2-0 at 132, Brandon Strickland finished 4-0 at 170 pounds and Hunter Trimmer was 4-0 at 182. Tyler Cooper was second at 220 pounds, as was Andy Williamson at 152, while both Tristan Stewart (195) and Kaleb Fisher (285) finished third. Jesus Rubio finished fourth at 126, while Jake Simmons was fifth at 145 and Josh Brown took sixth at 138. Highland’s Bryce Schott went 1-0 to claim the top position at 106 pounds, while Christian Miller placed second at 138. Gavin DeAngelo was third at 120, as was Austin Kelley at 152 and Jonathan Sparks at 170. Dillon Lehman took fourth at 145, as did Triston Hinkle at 160. Also, Ian White (182) and Javin Meade (220) were fifth and Andy Baker (126) and Will Biegler (285) took sixth. Cardington’s Deven Speck (285) and Skyler Streich (160) both placed fifth, while Tanner Jones (152) was sixth. Ryan Drury also took part in the 145-pound pool competition.